Q: “Does the library have any books about the Summer Olympics? The 2012 Summer Olympics is exciting and brings the world even closer with these international competitions. It’s great that you and your family are enjoying the events broadcasted live from London, and yes, there are some great resources and books to meet the variety of interests surrounding the Games. Delaware Libraries have an online resource for finding recommended reads for adults, teens, and children, through Novelist. This is found through our Delaware Libraries’ site, on the eMagazines and Newspapers, specifically on “Reading Recommendations”. You’ll find excellent summaries about the books, and the books and items that come up are conveniently linked to the Delaware Library Catalog, too! The official Summer Olympics 2012 website is found at: http://www.olympic.org/london-2012-summer-olympics (on the official Olympics site). One of our three National Libraries, the Library of Congress, offers interesting information and historic photos about the Olympics. If you enjoy Tweeting, keep up to date with the frequent posts about the Summer Olympics on Twitter. Catch the excitement and run, pole-vault, swim, dash, or leap to your nearest library for these and other great Summer Olympic-related reads! We’re glad to be of assistance and online, we’re 247! Summer is winding down and the US Presidential Election is heating up. It’s great that you asked about voting! Delaware’s population increases have made some changes in the voting districts. To find out about how to register and/or change your address, where your polling place is location, the last day for voter registration, and other details let’s start with the State of Delaware’s online information from the Commissioner of Elections. This comprehensive site offers everything about voting for Delaware citizens, from registration to election results. To register and/or change voter registration information (such as your address), you can use the online form or do this in person. See the “Places to Register” options. Here is the specific page that includes voter registration locations. Some public libraries in Delaware are also scheduled to have voter registration days. Here is the link for New Castle County’s list. Once you are registered to vote (with your current address), it’s easy to find your polling place. Just put in your first and last name and the Polling Place Locator will give you the name, address and hours of operation. You may also like to have a map that will lead you to your polling place, but you need to know your District. As mentioned earlier, some population increases in Delaware have necessitated District changes. To find out your District, the State of Delaware’s Elections site has maps. First, click on the county you live in. Then choose the type of District you’d like to view, such as the House District Number for the area of your Representative. There are specific PDF maps for each district and above those, links to the more general overview (to help you gain an idea of which District you are in). Once you have a number, click on the more detailed PDF map to see if your residence is truly within that District’s boundaries. 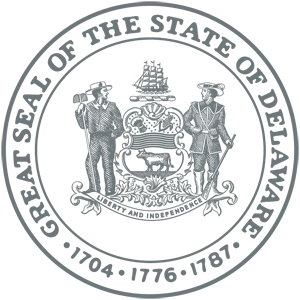 The State of Delaware’s site also has information that will help you find the name and contact information of your State Legislator. I’d like to add some Federal voting information here, too. First, a site called “Project Vote Smart” is a non-profit, no-partisan site and is easy to use. On the upper right corner you can simply search for a list of your Federal legislators by zip code. The White House’s site also has excellent ways to find your Senators, Representatives, and other elected officials, including contact information. Click here for help finding your US Senator. Use the “Find your Senator” field in the upper right corner. Click here for help finding your US Representatives. Once there, simply enter your zip code. The League of Women voters compiled a list of elected officials that represent us in Delaware, current in 2012. 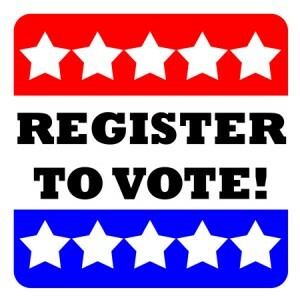 The last day to register to vote in November’s Presidential primary is coming right up: August 18! See the State of Delaware’s site for election deadlines. The Office of the State Election Commissioner’s site also provides a reliable place for election results. We’re glad to be of assistance and we’re 247! Carrier is best known for his work on air conditioning as we know it today. He grew up in New York and studied mechanical engineering at Cornell University in the early 1900s. His work on measuring heating systems led to cooling, and after more than a decade of research, to reducing humidity in air while cooling it. “The Great Idea Finder” website offers brief biographical features on inventors such as Carrier. 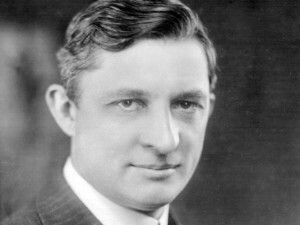 As stated there, “He was a dreamer, but he based his dreams on reality.” They quote him saying, “I fish only for edible fish, and hunt only for edible game – even in the laboratory.” See also the site, American Inventors regarding Willis Carrier. Another important person involved with shaping the mechanics and portability of air conditioning as it is today is Frederick Jones. Biography.com’s website mentions his work as pertaining mostly to refrigeration, but “His portable air conditioner was used in World War II to preserve medicine and blood serum.” The specialty of the air conditioning Jones worked on also led to automatic refrigeration in long-haul trucks that we see on the road today, according to the site “Famous Black Inventors”. Inventors like Carrier are life-long learners, building upon today’s ideas to create better futures. Like libraries, they adjust and adapt, share and develop ways to to reach communities everywhere. Carrier was a visionary (he died in 1950) and saw opportunities to improve the quality of life through steamy summers and in hot climates. Now, environmentally sound methods are being explored such as those discussed on the site, “Green Living Ideas“. Thanks to Carrier, Jones, and other great mechanical engineers, scientists, environmentalists, and concerned citizens, we can continue to further build upon this simple idea of chilling the air and reducing humidity in our homes, libraries, offices, hospitals, shops, schools – even when the local meteorologist is calling for triple digit heat indexes. The Permanent List feature that is provided through the Delaware Library Catalog is a handy way to personally keep track of items you have borrowed, or would like to borrow in the future. You have control of the lists you create and can organize these to suit your needs. 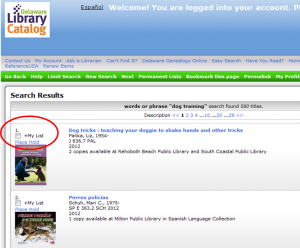 Just go to the Delaware Library Catalog. 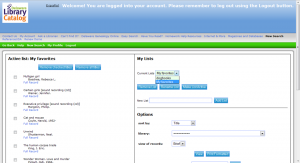 Log into your library account using your 14-digit library card number (with no spaces) and your PIN. Look on the green bar for “Permanent Lists” and click on that. name the list you’ll create something that makes sense to you. For example, maybe you’d like to have a list to add items that are about one of your favorite subjects, like dogs, or about your interest in movies! be sure to make the list you are working with “active” by clicking on “Make List Active”. Now search for any item or items you’d like to add. You can simply click on “New Search” to begin. When you find books, movies, audio books, and other library items you’d like to add to your list, you should see a checkbox to the left to add it to your list (see image). That’s all there is to it! You are on your way to creating lists of items you’d like to read, watch, and listen to in the future, or ones that you have checked out and want to remember. You also asked if the library keeps a list. Libraries are dedicated to patron privacy, so after you return items and there are no fines or fees attached to these, they are eliminated from your library account. So permanent lists offer a way for you to privately keep track of items you have read, watched, and listened to as well as those you may be interested in enjoying in the future, privately and securely. Many have heard the story about Francis Scott Key and how, when detained on a British ship overnight in 1814, was moved to write the words while witnessing the shelling of Fort McHenry in Baltimore. A brief synopsis of this piece of history can be viewed on InfoPlease, an online encyclopedia. But how did the lyrics turn into a song, and this become our national anthem? According to the Smithsonian Museum’s online information, Key was an amateur poet who was inspired by seeing the nation’s flag. The Smithsonian states, “the morning after the bombardment, he scribbled the initial verse of his song on the back of a letter” and they offer a link to the original four verses on their site (as well as a recording that was performed using original instruments). The melody came from a song known to Francis Scott Key, an English tune known as “To Anacreon in Heaven”. You can listen and compare this to the song we’re familiar to today. The song officially became our nation’s anthem many years later. It wasn’t until the United States was deep in the Great Depression, in 1931. 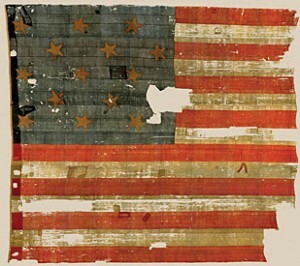 As the Smithsonian Museum’s site indicates, the “Star Spangled Banner” was really given its boost as a source of patriotic pride during the War of 1812 (not the Revolutionary War). As a sidelight, periodically you will also see information about “America, the Beautiful” as an “unofficial national anthem” too, as with the online 2009 post from the popular “20/20” television news show. That debate continues! But for now, we’ll see and hear our nation’s marching and military bands and vocalists patriotically sing the “Star Spangled Banner” this Wednesday, July 4, in honor of our Independence Day. If you would like to sing along, here is one of many pages that offers the words and music, from the National Institute of Environmental Health Sciences for Kids.